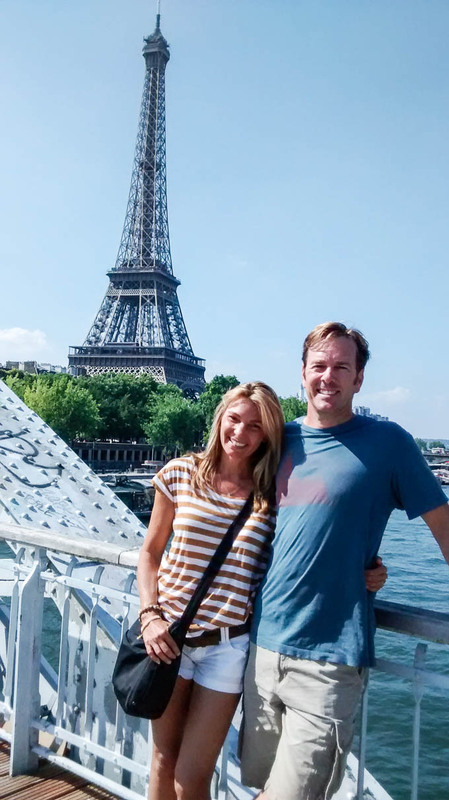 When my husband suggested we go to Venice, I hesitated. Venice is one of the most unique and beautiful cities in the world but during the last 15 year, it’s become a circus of tourists (an estimated 30 million a year to be exact). For this reason, I’ve avoided it. But, on route to the Dolomites in July, I snuck into Venice and managed to avoid the crush of visitors. 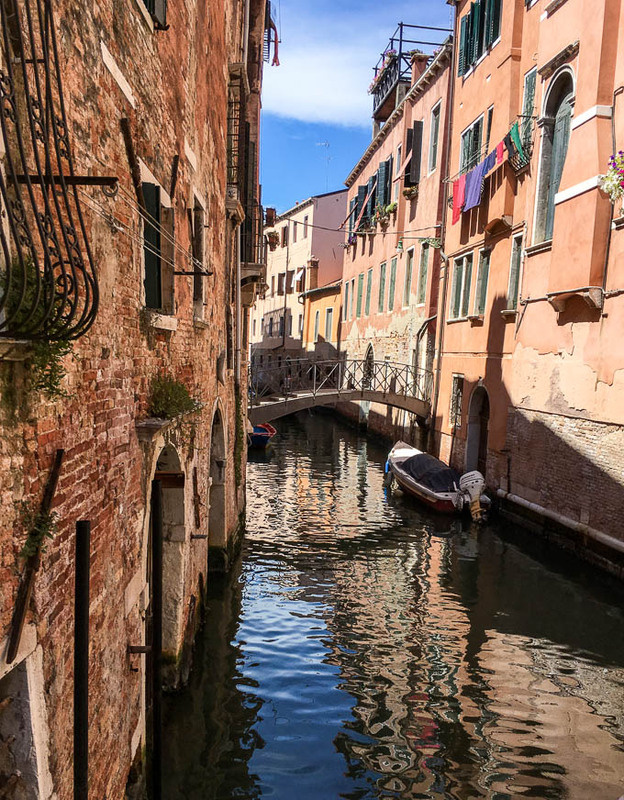 I meandered through it’s narrow streets, walked along it’s romantic canals, crossed over it’s petite bridges, chatted with locals, and avoided the massive crowds. So, how did I enjoy Venice during the busiest month of the year?????? Golden Milk – Yay or Meh??? So, what do you think of the Golden Milk trend?? 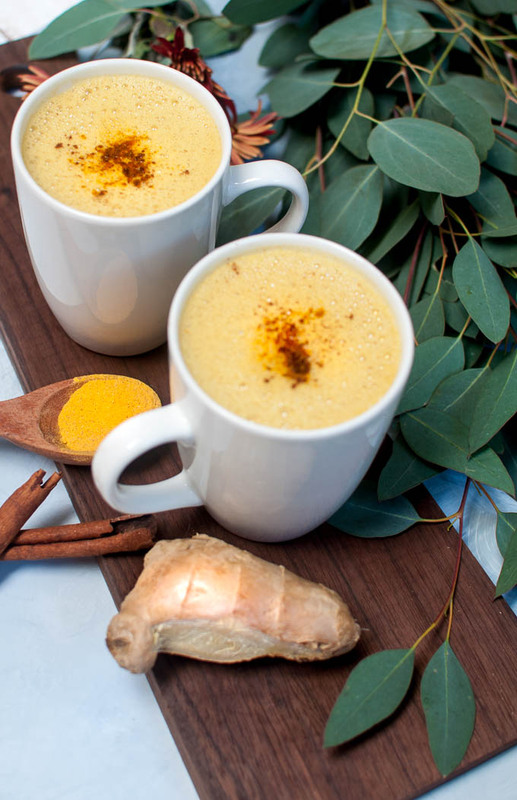 Are you on board with sipping this hot Turmeric Ayurvedic drink or would you rather have a hot cocoa or pumpkin latte??? Since I’m a sucker for anything “healthy”, I had a bee in my bonnet to try making this at home. My Kind Organics Golden Milk powder was on sale, so I bought it out of curiosity and played with the recipe to customize a yummy, frothy GOLDEN YELLOW hot liquid beverage. 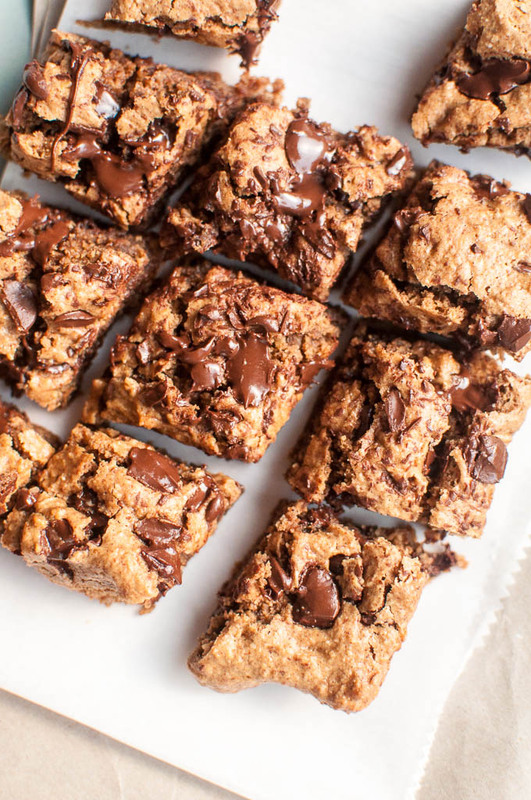 If you are craving rich, decadent blondies that are vegan AND gluten free, these are them!!! 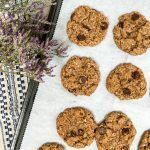 I baked a batch of these “beauties” to see if they’d make a good hostess gift for a weekend visit to our dear friends in L.A. Not everyone drinks wine and I’ve given too many floral bouquets. But WHO can resist a box of home-baked treats? (I even went to Micheal’s craft store to buy a special box for them – presentation counts!!). It’s difficult to say what captures your heart when you visit a place, but you might just fall in love with Cortona. Cortona is an artsy hill town on the Tuscan/Umbrian border. Many hill towns have been overrun by tourism, but Cortona’s year round residents maintain it’s authenticity. Francis Mayes put Cortona on the map with her book, Under the Tuscan Sun. The story of a recently divorced woman whose spontaneous purchase and of a crumbling villa in Italy, restores and revives her own broken heart. Cortona is also a favorite destination of Jordan Schlansky, Conan O’Brian’s quirky producer and Italianfile. 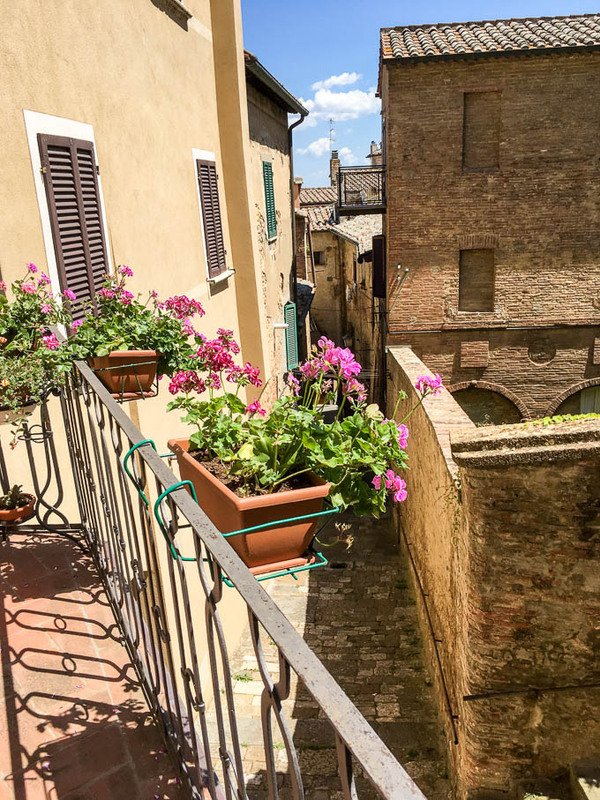 I spent 4 days in Cortona and it left a strong impression. I don’t like eggplant. I admit it!!! It’s one of the only vegetables I struggle with. Eggplant can taste bitter, greasy, or cause digestive problems. Oddly enough, I’ve ALWAYS loved Baba Ganoush , a hummus-like Middle Eastern dip made with………eggplant. 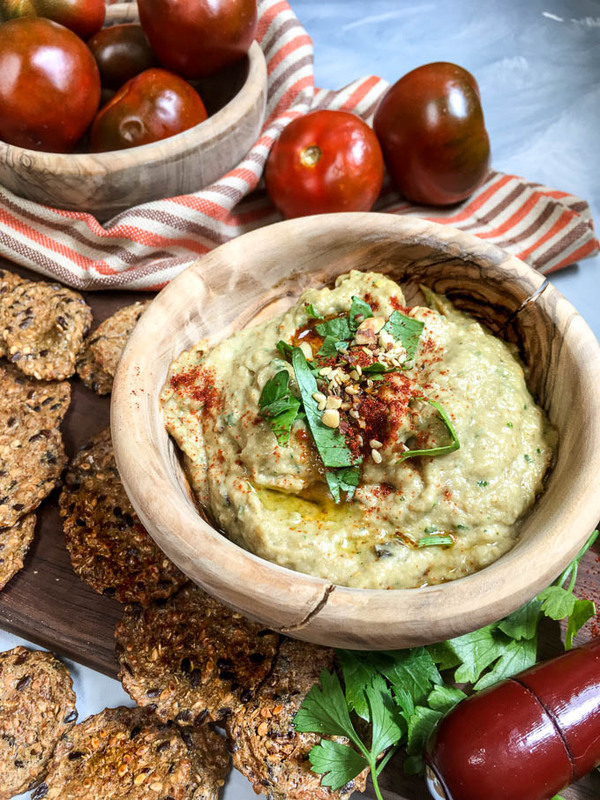 Eggplant works perfectly in this dip, lending a smoky flavor and creamy texture. It’s neither bitter nor greasy and it’s easier to make than traditional chickpea hummus. 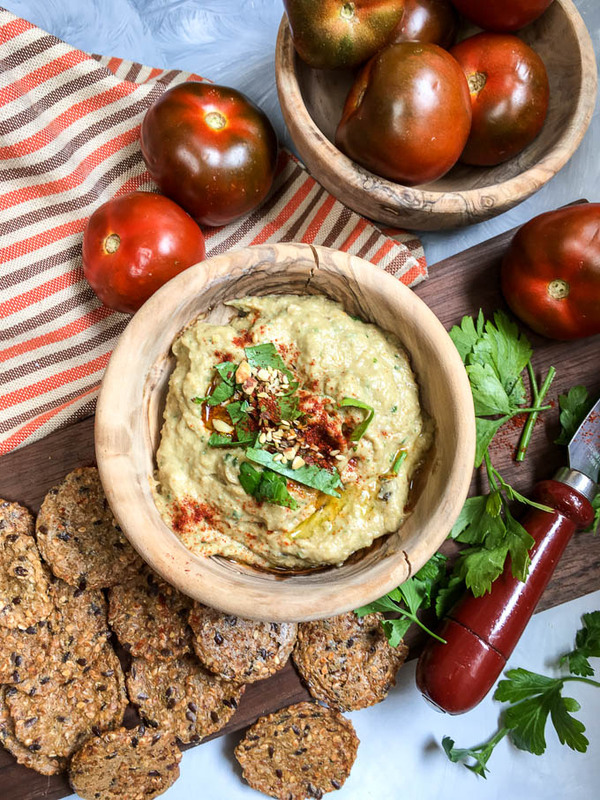 Having reduced my intake of beans (to nearly nothing), this healthy Baba Ganoush dip has become my FAVORITE bean-free hummus alternative. 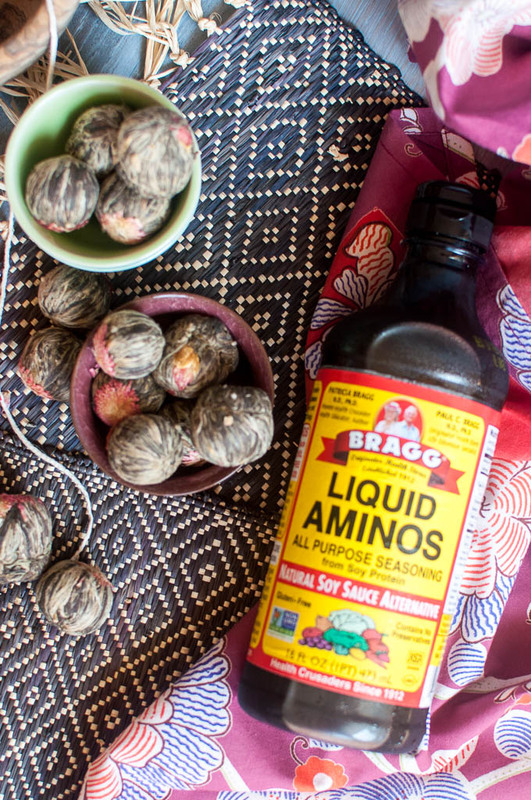 What is Bragg’s Liquid Aminos and Why Would you Try it? I love the taste of soy sauce but prefer it’s healthier cousins like Tamari, Coconut Aminos, and Bragg’s Liquid Aminos. So, what are these alternatives and how do they differ from traditional soy sauce? Keep reading…. The Dolomites, situated in Northwest corner of Italy on the Austrian border, are considered one of the most a beautiful mountain landscapes in the world. Once known as the “Pale Mountains”, this natural paradise was declared a Unesco World Heritage Site in 2009. 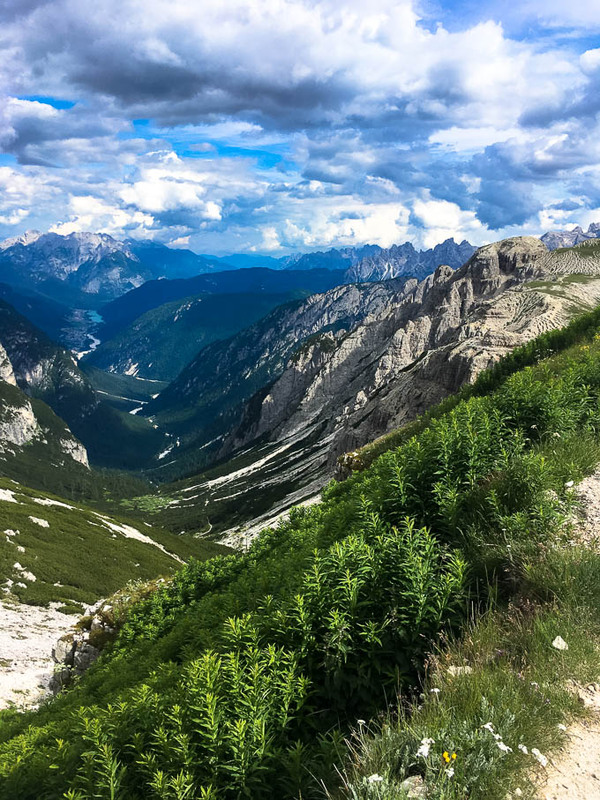 In early July, my husband and I treated ourselves to a week hiking the Dolomites with REI (outdoor adventure company) and are still giddy from the experience. Sipping cocktails poolside sounds relaxing but active trips can be life-changing. When my heart was racing after 2 hours of vertical climbing, I felt completely present and at peace. The alpenglow colors illuminating the rocks at sunset, the emerald pastures, greenish-blue lakes, flowering meadows, vertical walls, and cragged peaks make this one of the most remarkable mountain ranges to explore. 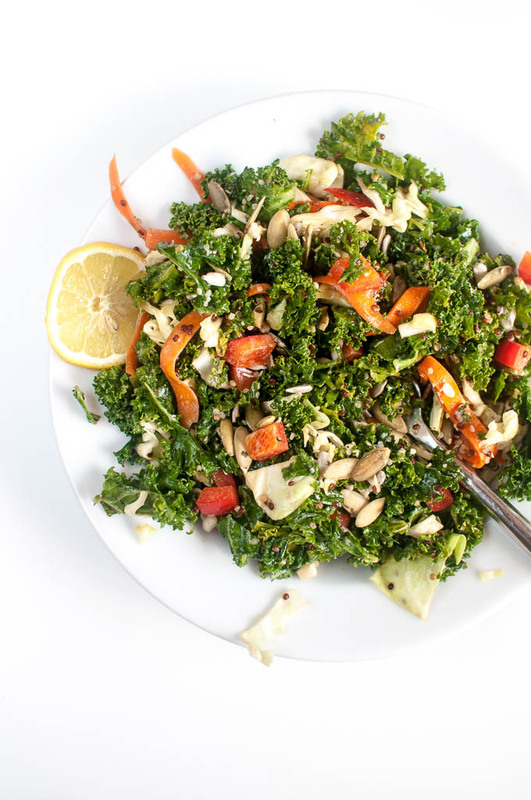 If you aren’t convinced yet, keep scrolling…..
Are you getting enough greens? 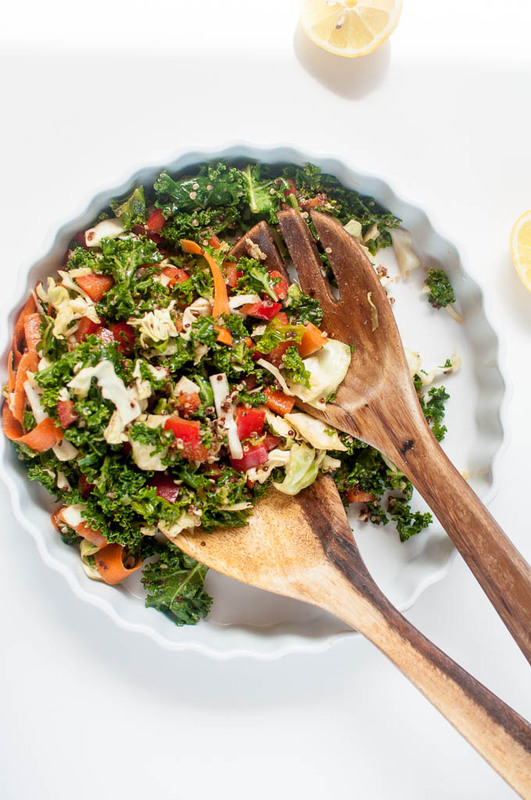 Most people will answer “no” to this question which is why I’m posting this vibrant and nutritious Kale n’ Quinoa salad.“Recent research estimates that the optimal intake for reducing our risk of heart disease and early death to be around ten servings of fruit and vegetables a day” (source). We know we need to eat more greens but isn’t it easier to grab a hamburger, fries, or slice of pizza? 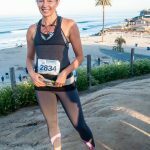 I used to worry a lot about how to travel as a vegan. And, at times, those worries were justified. But, mostly traveling as a vegan ends up being fun and easy. In fact, some of my FAVORITE vegan meals have come unexpectedly from restaurants around the world. 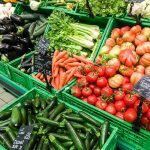 Not only are more countries adopting vegan friendly attitudes but environmental sustainability is moving plant based eating into politics all over. 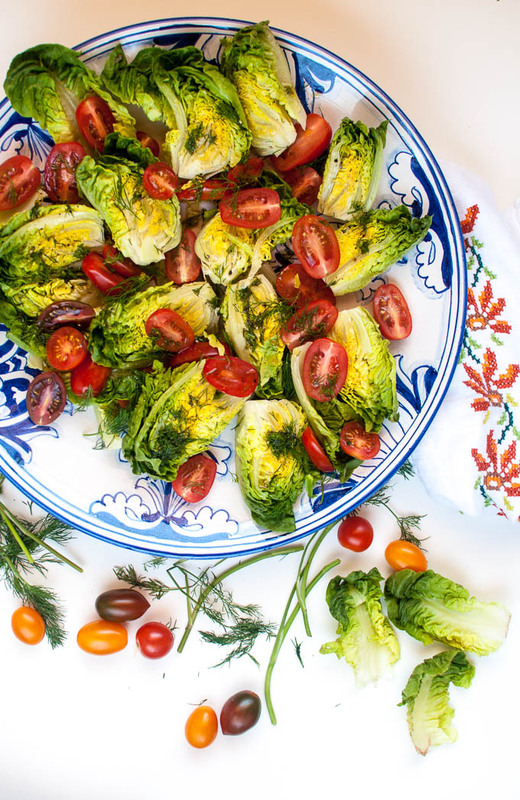 In fact, Portugal recently passed a law requiring all civic restaurants to offer a vegan option. This law is intended to promote healthier eating, decrease harm to animals, and reduce long term environmental impact (source). Personally, it’s been my dream here in the U.S., but I’m thrilled it’s starting somewhere. This EXCITING news is music to my ears and makes me more eager than ever to plan a trip to Portugal next year. 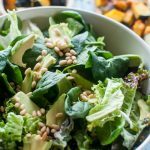 Summery Gem Lettuce Salad – And How to Make a Dinner Party Sparkle! My neighbor Ann is amazing! Despite being in her 80’s (and still working part-time as a lawyer) she’s my entertainment guru. Whether she’s throwing a holiday gala, decadent dinner party, or casual drop-by of wine and nibbles she entertains with grace, charm and elegance. She always sets a beautiful table and serves wonderful food making her fêtes very memorable. 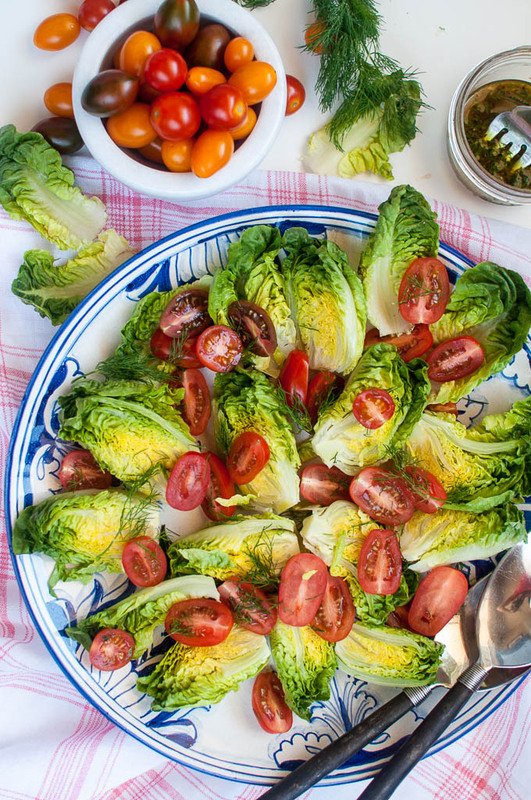 At her last dinner party, she served this stunning gem lettuce salad to the oohs and ahhs of all her guests. Not only was this salad well received but not a leaf of lettuce was left. Now, I’m sharing this beautiful salad here.